Magento is a pretty complex bit of kit to get your head round as a beginner. There’s so much information with any new project and such software is notoriously difficult to start to get to grips with initially. The best way to get on top of it is by taking advice from people who are already experts. That way, you can pick up hints and tips as you go through the learning process. We’ve compiled a list here for you of who we think are the ‘must follow’ folks on Twitter when it comes to the ecommerce platform. They’re all experts who help others by posting great content for people using Magento aimed at everyone from total beginners through to other experts. After all, there’s always more to learn even if you already know the platform well. We’ve picked out the people that we think really have an important and influential voice in the Magento community. Jansen is a fantastic guy to follow if you’re looking for someone to explain the complex technical bits of Magento in an easy-to-understand, creative way. He’s the Dutch community manager for Magento and one of the founders of Dutchento. If you’re looking for someone who shares his experiences through blog posts, community news, guest posts, presentations and conference speeches and who manages to communicate all things Magento really well, he’s your guy. He’s prolific on Twitter to so there’s plenty to be getting into. One of the core developers on Magento, and so definitely one to follow is Ivan Chepurnyi. Otherwise known as the King of Magento, so you know… just follow him. Kimberely Thomas is an expert on responsive Magento themes. If you’re looking for regular hints and tips about themes, community news or information about mobile ecommerce, she’s your girl. If you are looking to get into Magento development, then Alan Storm runs an awesome blog. He’s also on Twitter sharing both professional and funny tweets. Brent Peterson is great if you are a totally new to Magento. He’s happy to answer questions as the forum moderator for Magento. He’s a full blown Magento evangelicalist and often trumpets hints and tips for everyone, proud to move the Magento community forward. If you really want to get good at Magento, going to one of their Magento Events is a great idea. Keren Adam Aminia is the event lead at Magento and so is the person to follow if you want to get all the news about the latest conference, training session, or certification event. 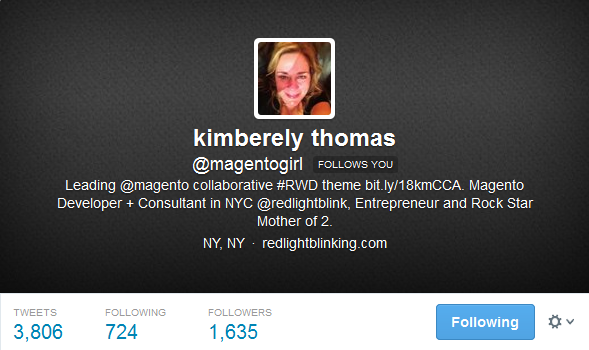 Magento development is hard, so you want to make sure that you’re following the right people. Ben Marks is one of the most popular Magento trainers, always happy to answer questions, as well as a publish writer in php architect ((Re)Introducing Magento and (Re)Introducing Magento: Configuration XML). With nearly a decade spent learning all there is to know about Magento, he’s definitely one for your list. Is there anyone we’ve missed out? Comment below.